Things have been busy around here, both in reality in my mind. I am thinking of all the lovely things I could make in time for the holidays. However, if you are on my holiday gift recipient list, you might want to stop reading the blog for now. Hah! I’m probably going to wait to post anything major till after the holidays (assuming these ideas become realities), but you’ve been forewarned. 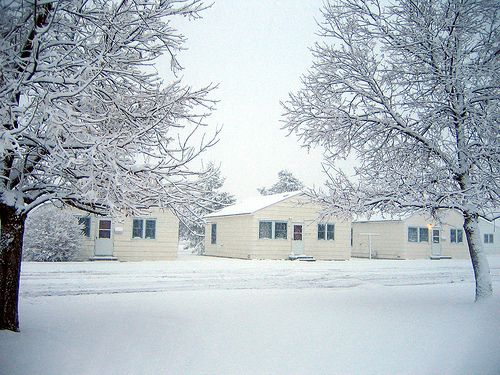 It’s been snowing a lot, and to me snow= Christmas. I already bought a small sparkly pink tree. So, according to my boss and the snow, it will be Christmas till March. The combination of snow and sun is so bright that I actually have a headache. I don’t mind though, because it’s much better than depressing gray weather. Yay for the sun in winter. Here’s a picture I took on the walk to work this morning. I also made some quick journals that I’m either selling or gifting. I haven’t quite decided. 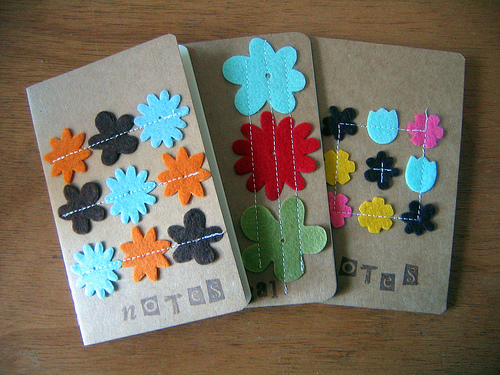 The felt flowers are from American Crafts (I love them!). And I worked on a fun placecard project for Thanksgiving, which I’ll post later this week. 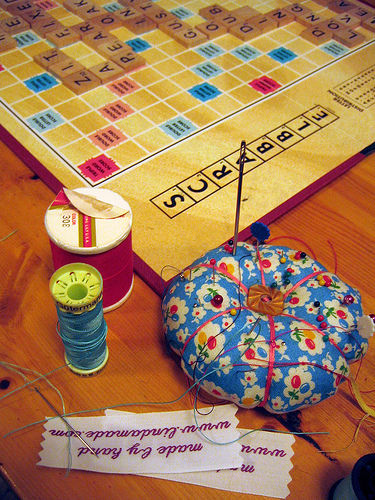 For now, enjoy this weekend vignette: me sewing labels into hats between scrabble turns. They finally came from namemaker, and I have to say, I’m pretty disappointed. For the cost (about $70 for 100), they aren’t super high quality (they weren’t even cut! ), and I also had no idea they’d turn out so long. They tell you they’ll make the length as long as your type mandates, but I guess I didn’t have a good idea of the font size (my last labels were the same height and about half as long). Needless to say, once I run out of these I’ll be taking my business elsewhere. But hey, at least I am winning this scrabble game –for now! I don't want to sound too spammy, but if you get your labels from http://customwovenlabels.com you won't be disappointed. I like your work! It's beautiful! Colourful!! I'm from Spain and my blog is: http://androides-nomolestar... and I would like to invite you to visit it. Mine are black and pink with little cutie fire breathing dragons on them. They're pretty silly. I feel like they should say "made by grandma" but I love the old skool quality of them. I got mine from custom couture label co. on etsy and I was THRILLED with mine. Plus the seller is so helpful, we emailed back and forth quite a bit before finalizing my labels to make sure it was exactly what I wanted. Price is VERY reasonable as well. Check her out next time. I think I paid $25 for 100 labels, and she included a coupon with my order for 20 free on my next order.